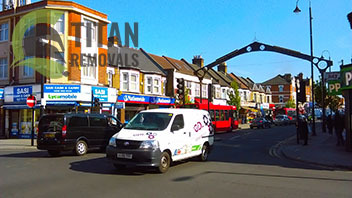 Welcome to Titan Removals – the best moving company in the London Borough of Newham. When it comes to professional removals in Newham, like anywhere else, there is an easy way to do things and a hard one. The stress/hassle-free manner in which you can approach your upcoming home or office removal in Newham is to give our company a call. We are going to send a team of very well trained, fully licensed and equipped professional movers who are going to handle your relocation job with the due diligence, care and respect. Expect nothing short of impeccable results when your removal in the E and IG postal areas in the London Borough of Newham is handled by our experts. In short, you can lease a storage unit from us, both long-term and short-term, at a very reasonable price. We require no minimal contract period and you can check in and check out your boxes at any time of the day and night. The units we offer vary in size – from a small locker to huge spaces of 100 sq feet and above. If you need help with moving your goods to storage, we will gladly send a man and van to collect your boxes at a time that would be comfortable for you. Our facilities are in the E and IG postal areas, which contributes to the comfort our storage service would provide you with. Packing is a very important part of every home or commercial removal. As a leading moving company in Newham, at Titan Removals think about that too. That is why we have tailored a very comprehensive packing supplies delivery service. You can purchase durable moving boxes, wrapping materials and other packing supplies from us at a cut rate. If you cannot assess how many boxes you are going to need in order to pack your goods for the road, let a member of our team of licensed experienced movers in Newham come to your place for a viewing. An expert of ours will not only consider your needs better than anyone else, but you will also be provided with some tested tips about getting around the task quicker and up to the best results. Take it from us, you should not make any compromises with the way you do the packing before a relocation. That is, of course, in case you want your things to arrive at the assigned location safe and sound. Contact our around the clock customer support for more information about our packing materials delivery options for the territory of Newham. The London Borough of Newham is located in East London, mostly to the north of the River Thames, though parts of the borough are on the south bank too. Currently the population of all districts here is around 324 322, living on a territory of approximately 13.98 sq miles. Newham came to prominence recently thanks to the decision for the majority of the London Olympic Park to be built here. Newham is well known for its strong community spirit, which manifests in The Hub, a community resource centre which was entirely built through efforts of local residents, as well as the innovative green resource centre known as the Grassroots, which was again made possible thanks to the hard work of groups of local people. Queens Market is popular destination in the borough, not only for residents but also for people from other parts of the capital, and even tourists. Three Mills remains the only museum here after the closure of North Woolwich Old Station Museum in 2008. Three Mills is a complex of tidal mills, probably the largest and most powerful ever built in the entire world. At present they are managed by the River Lea Tidal Mill Trust Ltd. Two of the University of East London’s campuses can be found here as well. Those are the Stratford Campus, at Stratford and the Docklands Campus, next to the regenerated Royal Albert Dock respectively. There are a number of schools and further education institutions in Newham that deserve attention as well, such as the famous Rosetta Arts Centre based in the Debden House, which serves as a residential adult education college in Loughton, Essex. Don’t try to move things yourself and instead get in touch with a professional removal company such as ours. 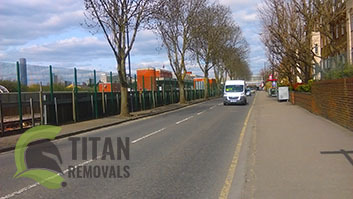 Titan Removals will provide you with the most reliable relocation assistance in Newham and will charge you very little for it. Every aspect of our moving service is top class. We are versatile bunch of energetic people which are able to perform both domestic and business relocations equally well. If you call us for your household relocation then be sure that you will receive elite assistance by very well prepared people. Our helpers are available at a reasonable price and their presence will be deemed invaluable. We work in a very quick manner while still being careful and delicate with your fragile items. We should also mention that we are fully insured so you know that your items are safe with us. Our workers will also have all the required supplies for packing and lifting thus making the whole process a lot easier. We will find the most suitable box for all of your goods and whatever can be taken apart will be disassembled and put into flat boxes. Office removals are also executed to perfection and our deliveries are with impeccable timing. Your equipment or computers will be put in bubble wrap and taped so that nothing goes wrong during the transportation. Our drivers are familiar with the area and nothing will get in their way. Newham is a London Borough in East London. Interestingly enough even though the borough is considered to be located north of The River Thames its south most areas are actually situated past the south bank of the river. The demographic picture in the borough is pretty dynamic and there are people of many different ethnicities inhabiting it. The Three Mills museum is an excellent place of interest to visit in Newham.